A Coast Guard-approved wearable life jacket or personal flotation device (PFD) is required for each occupant on all types of boats in all waters. See additional PFD (life jacket) requirements on this page. Motorboats (including boats powered by electric motors) must be registered, and they must be registered in their state of principal use. Boat operators of boats with greater than 25 horsepower and born on or after Jan. 1, 1982, may not operate unless they have obtained and have in possession a Boating Safety Education Certificate. All PWC (personal watercraft) operators must have obtained and have in possession a Boating Safety Education Certificate. Persons 11 years of age or younger may NOT operate a boat with greater than 25 horsepower or a PWC. Persons 12–15 years of age may not operate a PWC with any passengers on board 15 years of age or younger or rent a PWC. Owners of unpowered boats (canoes, kayaks, rowboats, stand-up paddleboards, etc.) can launch their boats at Commission lakes, access areas and properties, and at PA state parks and forests if their boats display the Commission’s launch use permit OR boat registration, OR PA state parks launch permit OR mooring permit. An unpowered boat may have a registration OR launch permit, but it is not required to have both. The Commission does NOT recognize launch permits from other states. Did you know that the state liquid fuels tax you already paid on boat fuel is returned to the Pennsylvania Fish & Boat Commission for every gallon reported as used or purchased? This benefits you and other boaters by enhancing boating programs and facilities. When you renew your registration, you will be asked to report the total number of gallons used or purchased. If unsure, please leave the section blank–DO NOT use a zero. For more information about reporting boat fuel, liquid fuels tax and the benefits for boaters, visit ReportBoatFuel.com. Boaters are required, by law, to wear life jackets on boats less than 16 feet in length or any canoe or kayak during the cold weather months from November 1 through April 30. This requirement is intended to protect boaters from the dangers of cold water shock if they fall into the water. The risk of an accident being fatal is significantly higher when the air and water temperatures are colder in late fall through spring. Over the last 15 years, cold water incidents represented only eight percent of the boating-related accidents, but they resulted in 24 percent of the fatalities. Victims who are wearing a life jacket when exposed to cold water have potentially life-saving advantages. 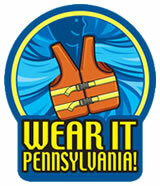 All boats must have a USCG-approved wearable life jacket on board for each person. In addition to wearable life jackets, boats 16 feet and over must have a throwable device (ring buoy, life ring or buoyant seat cushion) on board. Canoes and kayaks, regardless of length, are not required to carry a throwable device. Life jackets must be used in accordance with any requirements on the approval label. All life jackets must be in good and serviceable condition and legibly marked showing the USCG approval number. This means the life jacket must be fully functional, free of tears or defects in the material. All buckles, straps, zippers and other closures must be operable. Wearable life jackets must be “readily accessible,” which means that they are stowed where they can be easily reached or that they are out in the open ready to wear. Throwables devices must be “immediately available,” which means that the device cannot be in a protective covering and shall be within arm’s reach of the operator or passenger while the boat is operated. A PFD that is sealed in its original packaging is not readily accessible or immediately available. Life jackets must be the appropriate size for the person intended and adjusted to wear. A throwable device may not be used as a substitute for a wearable device. Children 12 years of age and younger on Commonwealth waters when underway in any boat 20 feet or less in length and in all canoes and kayaks. On Pittsburgh District U.S. Army Corps of Engineers lakes (only), everyone in boats under 16 feet and in all canoes and kayaks. All water skiers and anyone towed behind boats, in addition to personal watercraft operators and passengers, and sailboarders (windsurfers) are required to wear a life jacket. Inflatable life jackets are not acceptable for these activities. Boaters are required, by law, to wear life jackets on boats less than 16 feet in length or any canoe or kayak during the cold weather months from November 1 through April 30. MAKE SURE YOUR LIFE JACKET FITS! For a life jacket to work properly, not only does it need to be on your body, it should fit properly as well. A properly fitting life jacket is more comfortable (meaning you are more likely to wear it) but more important, it functions better. Life jackets that are too small or large can ride up or even come off when you are in the water. It’s easy to check a conventional life jacket for proper fit–just put it on. The jacket should fit you snugly with all zippers, straps, ties and snaps correctly secured. With a partner behind you, raise your arms like you are signaling a touchdown in a football game. Have the partner lift the jacket by the shoulders. The jacket should come no higher than your chin. If the jacket covers your face or comes off—that’s what would happen in the water. In this case, tighten the straps or use a smaller size. Water going over a dam creates a back current or undertow that can pull a boat into the turbulence and capsize it. This hydraulic can trap and hold a person or boat. Many dams are not marked and are almost impossible to see from upstream. State law requires that many low-head dams in the Commonwealth be marked with signs and, when practical, buoys upstream and downstream from these dangerous structures. The signs detail restrictions for boating, swimming and wading, and hazards posed by the dam. Boating and Alcohol Do Not Mix! Alcohol use increases the chances of having an accident. Alcohol affects balance, coordination and judgment. It is illegal to operate a boat while under the influence of alcohol or a controlled substance. Penalties include loss of boating privileges, significant fines and imprisonment. If a small, open boat capsizes, everyone should take a head count, check for injury and stay with the boat. Most small boats have enough flotation to keep them from sinking. If possible, the boat should be turned upright and the water bailed out. It can then be paddled to shore. It is also possible to paddle a swamped boat to shore. The golden rule if a boat capsizes is for everyone to stay with the boat. Swamping and Capsizing: If you do capsize or swamp the boat, stay with the boat and make sure everyone has a life jacket. Stay calm. If the boat can be righted, bail out as much water as possible, get in and paddle towards shore. If your boat capsizes or you fall overboard in moving water such as a river, get in the self-rescue position with your feet pointed downstream and near the surface to avoid potential head injury and foot entrapment. Falls Overboard: Falls overboard are dangerous situations. People fall overboard even when wind and seas are calm. The shock of falling into the water–especially cold water, can be life-threatening. Wearing a life jacket can be your only source of survival. The best means of survival is to already have a life jacket on and stay with the boat. When getting into or moving around in a small boat, always maintain three points of contact, keeping your weight low and close to the centerline. Don’t overload your boat. Do not allow passengers to stand in small boats or sit on foredecks, gunwales, engine boxes, seat backs or transoms. Watch crew members and frequently check that everyone is aboard. Wear deck-gripping shoes (bare feet have poor traction). Avoid rough water and weather conditions whenever possible. Practice a procedure for recovering someone lost overboard. Toss a life jacket over the side while moving. Test to see how long it takes to stop the boat, turn and retrieve the life jacket. Be a smart boater - take a safe boating course. *includes oars or paddles, anchor and line, bailer, marine radio, depth or fish finder, boating maps or charts, flashlight, compass, extra line, extra gas can and a first aid kit. The enjoyment of Pennsylvania’s flowing waters isn’t limited to anglers anymore. Anglers and paddlers must work together to be safe and reduce conflicts. Keep these things in mind when fishing or paddling. Respect paddler’s use of the water, they likely share your passion for that special place. Like you, paddlers contribute to conservation when they purchase related equipment, through the excise tax placed on fishing and boating equipment. Be mindful of paddlers and understand that activity may increase during higher stream flows. Share the channel. Paddlers should do their best to avoid crossing in front of you. However, they may have no other option. Respect other angler’s space. There is plenty of water for everyone, so there is no need to fish shoulder-to-shoulder. Share the stream. Fish and move on. Anglers should use the shoreline to travel from one point to another, rather than wading through the stream. Launch only at designated areas. Be mindful of anglers and respect their use of the stream. Don’t paddle unfamiliar waters without walking the stream first. Paddle only when stream flow permits. Be prepared to portage over shallow water, don’t drag your boat across shallow riffles, or other obstructions. Yield to wading anglers as you would natural obstacles. Look ahead and plan a way around anglers well in advance. Paddlers should avoid the angler if at all possible. Provide a wide berth around wading anglers, preferably going behind the angler. Do your best to avoid floating over an angler’s fishing spot. If a fishing hole cannot be avoided, let the angler know you meant well, apologize, and move on. Keep a distance from anglers on the stream bank. Avoid their tackle and create as little disturbance as possible. Pass anglers quickly and quietly, creating as little disturbance as possible and do not loiter nearby. Park only in designated areas; do not block driveways or other access. Clean your gear. Do your part to reduce the spread of aquatic invasive species; check, clean, drain and dry. Don’t litter. If you pack it in, pack it out. Take a few minutes and pick up litter others have left behind.